Children’s services in Rugby are under threat as the county council is consulting on plans to replace eight centres with ‘family hubs’. Warwickshire County Council will be launching a consultation on the future of children’s centres across the county as it looks to cut costs. Of the 39 children’s centres in Warwickshire, 12 could remain as family or community hubs offering reduced services – with Rugby borough’s eight centres going down to three hubs. 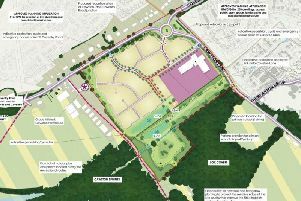 The current proposal suggests having one hub in Brownsover with the other two decided through the consultation with ‘outreach delivery sites’ where they are most needed. Around 40 jobs could be under threat if the plans go ahead, as the council tries to deliver services as the children’s centres budget may be cut by £1.18m. Council leader Cllr Izzi Seccombe said: “The proposals being put forward to reshape our services for 0-5 year olds were part of the budget process voted for by council in February. “We were clear that we are not looking to stop services for children and families. “This is an opportunity to look at how we provide the right services throughout Warwickshire that meet the needs of our residents. “The proposals look at evolving 12 of the 39 centres into family hubs to offer direct targeted support at locations where we have identified the greatest level of need. Rugby borough’s eight children’s centres are: Newbold Riverside Children’s Centre, Claremont Children’s Centre, Boughton Leigh Children’s Centre, Hillmorton Children’s Centre, Cawston Children’s Centre, Wolston Library and Children’s Centre, Dunchurch and District Children’s Centre and Oakfield Children’s Centre. Family hubs would provide a range of services including childcare and early learning, parental support and education, financial wellbeing, and healthcare. Liberal Democrat group leader Cllr Jerry Roodhouse said he will do what he can to make sure Rugby gets its fair share. “I am urging everyone to engage with the consultation which goes on for 11 weeks,” he said. “Change is coming due to the reduced funding cuts still hitting local government. Labour councillors also criticised the proposed cuts as they had managed to ‘fight them off’ in this year’s budget but now the Conservatives have a majority at the council. Richard Chattaway, Labour group leader on the county council, said: “It is quite clear that people value these centres and that they do a good job and it is my job as the Labour group leader to try to try to stand up for what people want us to do. Similar plans have been implemented by councils across the country to widespread opposition, famously in Oxfordshire where former Prime Minister David Cameron’s mother complained about the proposals. The 11-week consultation will begin next Monday (June 26), ending on September 8. To read the cabinet documents from the meeting on Thursday (June 15), click here. What do you think of the proposal? Send your thoughts to editorial@rugbyadvertiser.co.uk, comment below or tweet us @rugbyadv.